What is an Automatic Mains Failure controller? 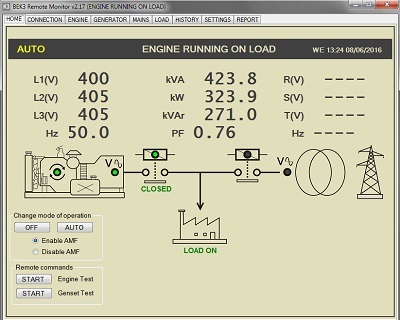 The AMF controller is a kind of module used in generator control panel when you have to control a generator that is connected in standby configuration. It is about a system that is waiting for a failure of the power utility. 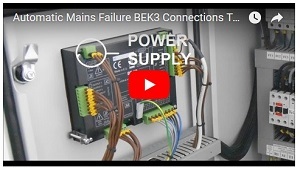 The BeK3-ZERO AMF Controller is an Automatic Mains Failure module designed for industrial power generators. It easily interfaces with diesel-gas-gasoline engines via analog or digital sensors. This controller is suitable for Automatic Mains Failure control panels up to 1000kVA. As you can see from the image, the functions of this AMF controller are intuitive. The area indicated  is the alarm panel. It indicates the presence of an alarm. The LCD displays is able to provide alarm information and log event record as well. By using the [ACK] push button you can silence the horn and push the alarm into the memory. The panel  allows you full manual control of the engine. You can start and stop the set. Two greed LED indicators informs you about the presence of the generator voltage. A green indicator informs you about the status of the engine. The panel  is committed to manually control the status of the circuit breakers. By using the commands  you can change the mode of operation. The indicators in the area  inform you in real time about the presence of the utility power and generator together with indications of the circuit breaker status. The areas  and  contain the push buttons that will allow you to easily navigate the display. The display  features tens of very-well organized menus about instruments, parameters, alarms and miscellaneous information. 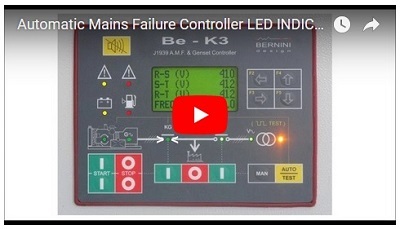 The BeK3-ZERO AMF controller is easy to connect. 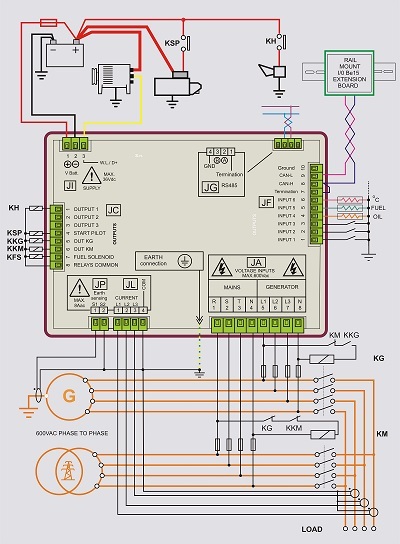 It provides the basic I/0 functions to control a power generator. You can install the controller on a power control panel like an AMF or ATS panels. The rear protection cover is made of special magnetic-steel. This will provide an extraordinary shield against magnetic field generated by the switching of the changeover power breakers. 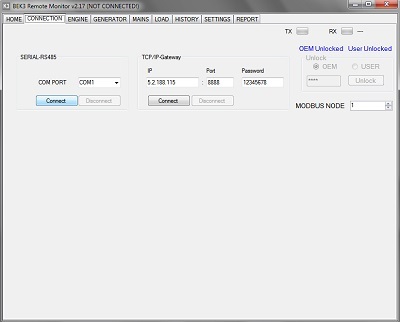 The BeK3 AMF controller features an RS485 serial interface that allows you remote monitoring via MODBUS, TCP-IP or GSM. Some screen shots are shown to explain the basic features of the system. The software is provided free of charge. When you apply the DC supply, the display indicates for a second, the version of the software and the date of production. A mode of operation is selected by push buttons and indicated by means of a yellow LED (indicators). Every time you activate a mode of operation, the display indicates a descriptive message (example [auto]). Every time the power supply is switched on, if the AMF controller was in TEST or AUTO prior to power down, the AMF controller returns to the “AUTO” mode. In the other cases, the AMF controller will enter the OFF mode. To shut down the AMF controller and inhibit all function you are required to push and hold the button [OFF] to enter the OFF mode. The OFF mode of operation clears the fault alarms and allows you to read or program parameters or simply to disable the AMF controller. The load is always connected to the power utility. The Display Back-light and LEDs are turned off to reduce power consumption. Push one of the push buttons on the front panel to turn on the display. Push the [MAN] button to enter the manual mode of operation or push the [AUTO] button to enter the auto mode of operation. Push the [MAN] push button to select the MANUAL mode. Push the [I] START push button until engine starts; the display indicates the message [STARTING] during the starting attempts and information about pre-glow. When the engine is running, the green LED indicator turns on. Push the [ I ] (KG) push button to close the contactor of the Generator. To transfer the Load to Mains, push the [I] (KM) push button (the [KG] will open). To open a circuit breaker, push the [O] pushbutton. In manual mode the CHANGEOVER timer lasts one second. To stop the engine, push the  STOP push button until the [StOP] message appears on the display. If the engine has already stopped, it is possible to reset the STOP sequence by pressing the [STOP] pushbutton. Push the [AUTO] push button until the yellowLED illuminates. 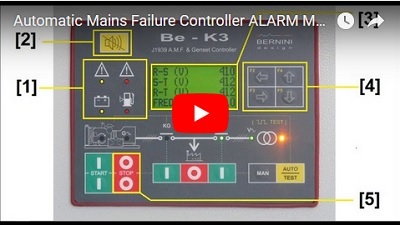 The engine starts when the AMF controller detects a Mains failur. The circuit breaker of the MAINS (KM) opens after the BREAKER timing. After the warm-up time, if the Voltage and Frequency are within the settings, the circuit breaker of the Generator (KG) will close. If the Mains restores, the KG will open. The KM will close following a programmed changeover timing. The Engine will stop after a cooling down time. If the engine shuts down, the KM closes independently of the Mains status if NFPA-110 mode is selected, otherwise the KM will close only if the Mains is within programmed settings. In AUTO mode, the AMF controller will periodically test the engine if the scheduler has been programmed. During this test, the yellow LED of the AUTO mode will continue to blink. In AUTO mode, the AMF controller can start and stop the engine according to programmed inputs (see the programming manual). Push & hold the [AUTO] push button until the yellow LED illuminates. 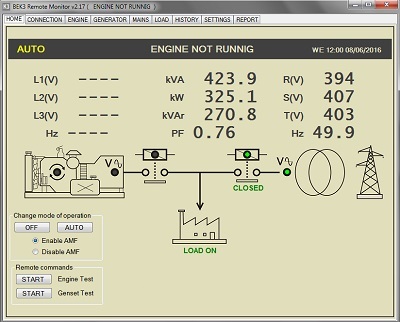 The AMF controller starts the engine and transfers the load to the Generator if allowed by your settings. To stop the engine, select the AUTO mode (if Mains is present) or select the OFF mode. If the mains fails during the TEST , the AMF controller will transfer the load to generator (supposing the generator parameters are within programmed limits). If you push the  push button when the AMF controller is in AUTO or TEST mode, the local emergency alarm will energise. To clear the alarm, you are requires to enter the OFF mode of operation. The BeK3-ZERO controller is supply with a factory measurements precision of about +/-1.5%. You can reduce the error down to zero by carrying out the on-site calibration. To do this, follow the instructions. 2) - Push and hold the [F9→] and [ACK-F10] push buttons simultaneously, for about 5 seconds, until the yellow LED [h/Prog.] starts to blink and display indicates [-CAL]; release the buttons. 1) - Press the [←F8] or [F9→] push button to select a 'Parameter name' (see Table 1). 2) - Press the [ACK-F10] push button to display the reading of the measurement (example 395 V). 3) - Press the [TEST ↑] (or [AUTO ↓]) to adjust the reading according to an external reference (example 400 V). 4) - When finished, push the [ACK-F10] again to display the 'Parameter name'. Select another 'Parameter name' to calibrate by pushing the [←F8] or [F9→] push button. When finished, you have 3 options: 5A, 5B or 5C. 5 A ) - Exit the procedure without saving by pushing the [OFF] push button. 5 B ) - Restore the factory default calibration: press and hold the [←F8] and [F9→] pushbuttons simultaneously until the display blinks twice. You are required to save the setting as indicated in step 5C). 5 C ) - Save the calibration: push and hold the [ACK] and [F9→] push buttons simultaneously until the [SAVE] message appears (approximately 5 seconds); the Be142 saves the calibrations and remains in Manual mode. An AMF controller (Automatic Mains Failure Controller) is mandatory in cases where you have to control a generator that is connected to the power utility in a standby configuration. In this case will call the power generator with the term Standby Generator. The AMF controller manages, in a fully automatic way, the connection assignment of the LOAD to MAINS or STANDBY GENERATOR avoiding direct connection MAINS to GENERATOR. 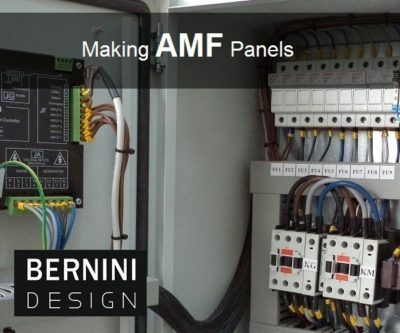 The panel AMF controller works in a control panel together with ancillary equipment: battery charger, electronic circuit boards, power relays and so on. The AMF controller is conveniently tasked with driving the power contactors. The size of the contactors define the required power rating of the panel. Available sizes on the market are normally in the range 25-250kVA. An advanced AMF controller features a range of adjustable settings and is engineered to comply with NFPA110 CAN/CSA-C282-M89 standards. An AMF controller must include an RS485 for GSM/GPRS/TCP-IP communications and an optional CANBUS interface to communicate with CANbus engines. The most critical set up is about power utility settings. As a matter of fact the main job of the AMF controller is to detect a failure of the power utility (so-called MAINS). A power outage can be total or partial. Can last for a few milliseconds, seconds or days. A BERNINI DESIGN made AMF controller is unique in the world. We have separated timers for power utility breaker and engine start delay. The timers can be programmed up to 24 hours. In addition to settings about Voltage, Frequency, Phase Sequence, Phase Unbalance BERNINI DESIGN has a special 'SELF LEARNING' software. It is a sort of 'FUZZY' logic that learn the characteristics of the Mains. The software continuously compare the variation of the Mains with the setting and the log history. This provides extraordinary results in system stability and fuel consumption saving. Supply voltage: 5.5Vdc to 36Vdc, 50-150mA. Protection: internal 300mA thermal fuse. Operating temperature range: -25 deg C up to +70 deg C. Humidity range: 5% up to 95% non-condensing. Static outputs characteristics: Output Current: 300mA/100Vdc short circuit proof. Logic: negative. Supply output for relays (terminal JC8): Max 1A at V battery minus 1Vdc (short circuit proof). Mains and Generator voltage input: Nominal Voltage input: 70 Vac-600Vac. Digital inputs: Open circuit voltage: Battery voltage minus 2V - Trigger level: < 2Vdc (max 15mA). Charger alternator monitoring: Operating voltage up to 36Vdc/3W. Vdc reading accuracy: +/- 5%. Supply voltage: the voltage range of the battery to guarantee a good performance of the controller. Beyond the specified limits the controller may not work or could suffer severe damage. Dimensions: it is about the total dimensions of the controller. Operating temperature range: /Humidity range. Climatic limits in which the controller can work normally. Supply output for relays: the maximum allowed current. Mains and Generator voltage Nominal Voltage input: the voltage operational limits of the AMF controller. Damage may be expected applying voltage beyond the specified limits, for uncontrolled period of time. Definition of 'Resolution': smallest discernible change of measurement result due to a minimum change in the input. Definition of 'Accuracy': deviation from the actual value as fixed by universally accepted standards of frequency and time. ALTHOUGH THE AMF CONTROLLER HAS BEEN DESIGNED IN ACCORDANCE WITH INTERNATIONAL SAFETY STANDARDS, THE AMF CONTROLLER MANUAL CONTAINS INFORMATION, CAUTIONS, AND WARNINGS WHICH MUST BE FOLLOWED TO ENSURE SAFE OPERATION AND TO RETAIN THE AMF CONTROLLER IN SAFE CONDITION. SERVICE AND ADJUSTMENTS SHOULD BE PERFORMED ONLY BY QUALIFIED SERVICE PERSONNEL. ANY ADJUSTMENT, MAINTENANCE AND REPAIR OF THE OPENED AMF CONTROLLER UNDER VOLTAGE SHOULD BE AVOIDED AS MUCH AS POSSIBLE AND, WHEN INEVITABLE, SHOULD BE CARRIED OUT ONLY BY A SKILLED PERSON WHO IS AWARE OF THE HAZARD INVOLVED.